A video of migrating mule deer in western Wyoming making the rounds at various science news websites is breathtaking, as well as groundbreaking for a team of scientists that includes a group from the UO's InfoGraphics Lab. In the video, deer navigate an often-treacherous landscape filled with highways, rivers, fences and lakes, as they travel between summer and winter ranges. GPS collars attached to some of the deer allowed scientists to track the deer. The video is a small, initial component of the Atlas of Wildlife Migration that is scheduled for completion in 2016. The atlas will document the migrations of hoofed mammals such as deer, elk, moose and pronghorn – also known as ungulates – in the region. "This is an exciting project," says James Meacham, director of the InfoGraphics Lab in the Department of Geography. "We are using our mapping skills and helping to document the landscapes of these communities of mammals as they migrate their way across as much as 150 miles." The UO's team includes Meacham, Alethea Steingisser, a cartographic project manager, geography graduate student Lauren Tierney, environmental studies undergraduate student Emily Nyholm and Megen Brittell, a graduate student in computer and information science and graduate teaching fellow in geography. 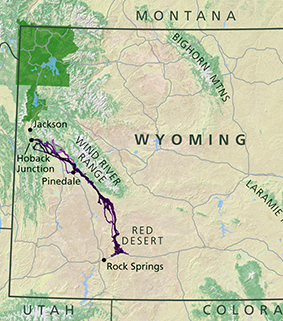 The leader of the Atlas of Wildlife Migration project is Matthew Kauffman of the Wyoming Cooperative Fish and Wildlife Unit at the University of Wyoming, who earned a bachelor's degree in biology from the UO in 1992. Because of the success of the award-winning Atlas of Yellowstone done by the UO InfoGraphics Lab in collaboration with officials across Wyoming, Kauffman turned to the UO for help. "At the University of Wyoming much of my work is on the ecology and conservation of the region's migratory ungulates," said Kauffman, who added he still has family living near Cave Junction, Oregon. "I had been thinking about a better way to tell the stories of these migrations when I saw the Atlas of Yellowstone. I heard about it when Jim Meacham and Andrew Marcus (UO geography professor and interim dean of the College of Arts and Sciences) made a trip through Laramie reaching out to some researchers here that worked in the Yellowstone area." With an atlas in mind, Kauffman said: "I just cold called Jim at InfoGraphics. The fact that Jim was at the UO was definitely another positive attribute, but the primary reason I contacted Jim is that his group is one of the leading cartography groups nationwide."